Step-up transformers (SUT) match low-output moving-coil pickups to standard phono preamps. Jensen’s extended frequency response and time accuracy produces legendary sonic transparency while Faraday and double magnetic shields gives them immunity to hum and RF interference. Models available for 3 ohm to 45 ohm pickups. The JT-346-AX is now a 346-AXT to match the 347. 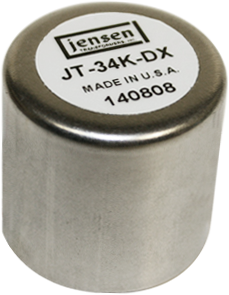 The JT-346-AXT is NOT suitable for a stand alone application. It is designed to be integrated into a moving coil preamp design and requires a 6.8kOhm load. As it will not work properly into a standard 47kOhm phono preamp.